The KONG Romperz are fun snuggle toys with bonded, reinforced layers and a replaceable squeaker. The crinkly paper inside the toy add even more excitement. 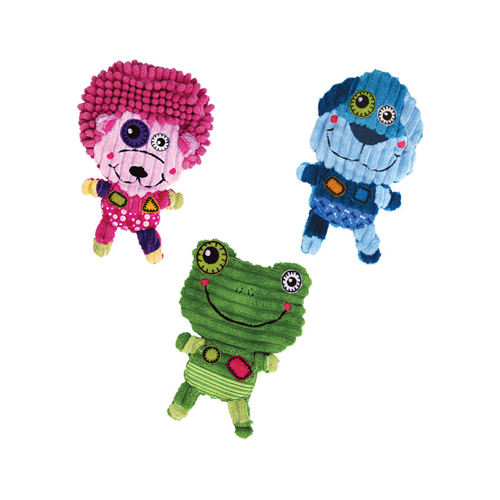 The Romperz are available in three characters: squirrel, frog and dog. These fun friends by KONG will give your dog hours of fun. The Romperz are made from multiple layers and have reinforced seams to make this toy extra sturdy. The plush is soft for the mouth and teeth of your dog. This toy also has crinkle sounds and a replaceable squeaker for even more fun. Please note: This product is shipped assorted, which means it is not possible to choose a character. You will receive 1 Romperz. Have you used KONG Romperz before? Let us know what you think about this product.